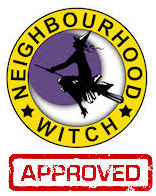 I'm very pleased to announce that A Bad Witch's Blog has become approved by a leading pagan retailer, Pagan Magic. This week I got an email from Pagan Magic saying: "We’ve just implemented a new policy whereby all links on our site have to be checked out for quality and usefulness for the pagan community –– your blog definitely fits the criteria." The shop added: "I’ve attached our ‘Approved’ stamp if you would like to use it as a badge on your website." You can see the badge at the top of this page. I now need to work out how to add the logo to my blog's masthead artwork. Pagan Magic is a family-run business based in north Devon that sells everything from athames and besoms to wind chimes and Zen oracle cards. Every member of staff is a pagan and specialises in different areas such as herbalism, crystal healing, kitchen witchery, divination, meditation and mythology. Its website www.pagan-magic.co.uk/shop/ not only offers a huge and varied range of items for sale but also includes a section with spells, recipes, rituals, lore and features on all sorts of interesting subjects, which are free to browse. A Bad Witch's Blog has been affiliated with Pagan Magic since 2008, which means that if you decide to buy a product from Pagan Magic through a link to the shop on A Bad Witch's Blog, such as the logo below, then I earn a small percentage of the price you pay. It won't cost you any more to buy the item, but it will help keep A Bad Witch's Blog running.